Hullo hullo! It's the first day of spring, and rather fittingly, the start of my first week in the third trimester. Three months to go until we get to meet our bubba - it feels like an age, and at the same time I know it will fly by! My second trimester certainly seems to have sped past twice as quickly as the first. I've been making notes all the way through to try and document my experience - excuse the rambling, and hope you enjoy! After simply feeling a bit flabby for the first few months, my bump emerged at about 16 weeks and has been doubling in size on a regular basis! 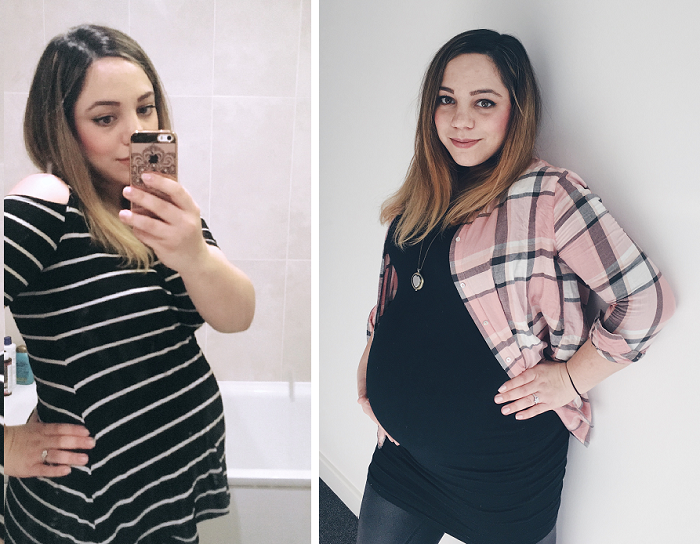 I'm now living in maternity jeans and tights (H&M are a godsend, I tell you) and although I can just about squeeze into some of my old dresses, I have had to buy a couple of stretchy maternity dresses to fit over my rapidly expanding belly. My skin, sadly, is showing no sign of this fabled pregnancy glow... I'm still getting a lot of spots, despite overhauling my entire skincare routine thanks to The Ordinary, and drinking so much water I'm rarely away from the loos at work. My hair is also the usual frizzy mess of yore, none of this magical hair growth I was promised! In terms of health, I'm regularly having blood tests and seeing specialists thanks to my underactive thyroid (a concern in pregnancy as it can affect the baby's development, although thankfully our bubba seems fine so far). Other than that it's just the expected aches and pains - my left hip keeps failing me, especially in Sainsburys, which means I've ended several food shops whilst hanging over the trolley to keep upright! Oh, and no one told me about the nosebleeds - such fun! The exhaustion is difficult too; I've been struggling with chronic fatigue for a decade now, but it's definitely been amplified by the pregnancy - I guess it's all just prep for newborn nights?! On a less funny note, I've also recently experienced some heightened bouts of anxiety - it's not something I'm used to, my previous experiences have all been related to depression instead. So rather than the usual absence of emotion and general sense of lethargy, I've been feeling the absolute opposite - everything is overwhelming, being in crowds or around people is overstimulating and can lead to panic. I'm almost feeling too much, rather than not enough - it's as though all my emotions have been switched to the highest level and most days I'm close to tears because of it. The midwife said it is most likely hormonal, which is fine - but it's not terribly easy to deal with! I've been trying to practise mindful breathing to calm myself, and to avoid panic attacks on my commute I try to listen to music or bury myself in a book, but it doesn't always work... so any advice would be gratefully received! Being in possession of around 60 baby books, I wasn't sure about attending NCT classes, and when my friend mentioned hypnobirthing I was both intrigued and sceptical. I thought hypnotherapy literally means you get hypnotised, you see - I couldn't have been more wrong! We attended the Babies in Waiting course in Billericay for 4 weeks and it was absolutely wonderful. Hypnobirthing challenges a lot of preconceived notions of labour and birth, and encourages the use of breathing and visualisation as relaxation techniques, with the idea that you'll have a calm, assured state of mind during the birth. 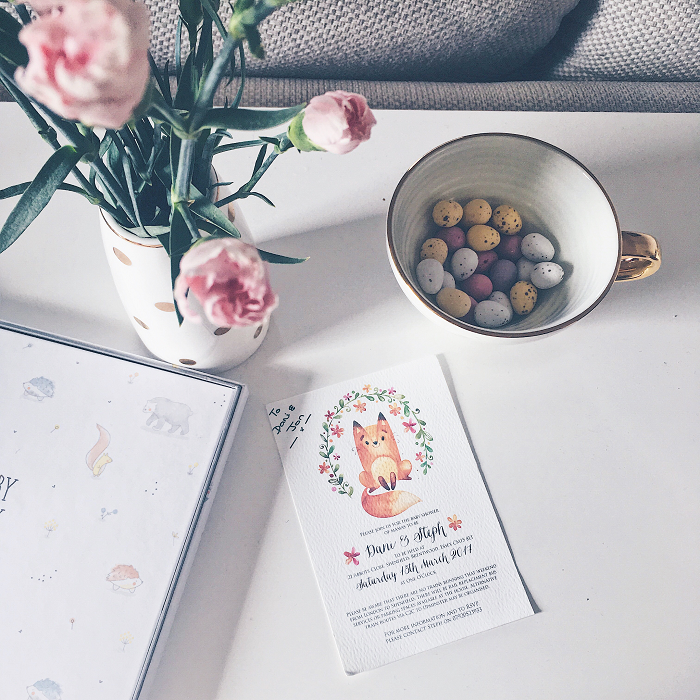 It really appealed to me, and helped to reassure both Jon and I to the extent that I'm now rather excited to give birth! We shall have to practise a lot before June but the techniques help me to get to sleep at night and I've already noticed an improvement in my stress levels. I'm definitely going to visit some of their relaxation classes once I'm on maternity leave! Most importantly though, baby is doing very well - flourishing in fact, no matter how much I'm suffering! We have a big bubba on our hands, measuring at least 2 weeks further along at the moment, but from the leg and body measurements at our most recent scan it looks as though we are expecting a tall child, like Jon! We found out baby's gender at 17 weeks, but I'm not sure whether we will announce it before the birth (although close family and friends know what we're having). I didn't actually want to find out the gender as I like the idea of a surprise, whereas Jon was very keen to find out, so this will be my little compromise. In terms of decorating the nursery and buying clothes I've still kept things fairly unisex, mainly because baby clothes are so cute, how can you possibly decide between boys and girls?! Hope you enjoyed my thoughts on pregnancy so far! Is there anything you'd like me to talk about further? I'm always wary of rambling too much about babies and such things! Let me know!